‘Tis the season, and if you’re looking for the perfect way to fill stockings, delight music lovers, or surprise your next door neighbor, here’s a one-stop shopping tip. 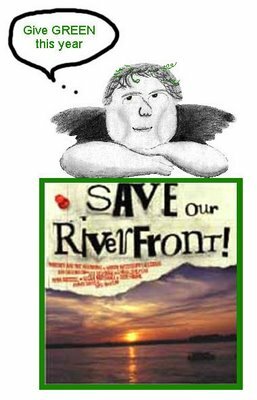 Order a copy of the CD “Save Our Riverfront” for those on your list and help protect and improve the Memphis riverfront at the same time. It’s available on-line from Zebra Ranch or you can pick-up copies at Davis-Kidd or Memphis music stores. Memphis musicians and artists have given their talents, now it’s your turn to pass the gift along. Click here to read reviews. Click here to order. We wish you a very merry holiday season and thank you for your involvement and support during 2006.